I hope you share too! I value friendship and good conversation. I look forward to talking with you all. For the 2014 A-Z challenge, I'm doing ficlets in a new fantasy world, featuring catkin and other fantastic beings. Here is the A-Z prompt list, with links to the posts as I write them. As I write this, I'm still hoping for prompts for many letters of the alphabet. Thank you in advance for your questions, prompts, and comments! You can find links to my flash fiction, to my serialized story, Fireborn, and to my poetry and songs over at my new (under construction) website, www.wyld-dandelyon.com. You can also find some of my fiction, poetry, worldbuilding, and artwork over at www.tornworld.net, along with the fiction, poetry, world-building, and art of my talented co-creators there. If you miss my old, long-winded landing page, you can find it and the landing pages for various projects by searching on the "landing" tag. with your comments, nominations, and sponsorships! I wrote a bit for patreon, released first to my patrons, but set to become public after a while. Now I'm putting it here because I'd love some conversation about the things I was musing about. If you want to see things like this or excerpts from works in progress, you could follow (or even properly join) my patreon. I’ve been reading Tarot cards for a very long time, but the Tarot is still mysterious to me. It seems to work—but how? I’ve done readings for so many people who say the reading was spot-on, people I know, people I don’t, people online and far away. But it’s more than that. I’ve done readings in LARPs and role-playing games too, in character, and the reading proved accurate for the character (and not the player). A character has no physical presence in the world, except insofar as it is embodied by the player or writer. If one follows the theory that someone’s aura, their physical or mystical presence, somehow interacts with the world, that would imply that characters, even casually created characters that have only been imagined for hours or days, still have a mystical presence that is strong enough to interact with the cards’ mystical presence. It seems even more mysterious to me when I’m drawing cards for a story, where all the characters are only in my head (or some other writer's head) until words flow through fingertips onto the screen or page. I mean, if even their creator doesn’t know what the plot is or who these imaginary people are, how can the cards possibly interact with their mystical presence? Doing readings over the internet also means the people I’m interacting with aren’t there to physically interact with the cards. How does this mystical presence thing work when there are hundreds or thousands of miles between the cards and the querant? If it’s a mystical presence thing at all. Another theory, of course, is that the cards are truly random, and any meaning is created by the human mind. With that theory, it’s easy to explain why the cards work for writing: I’m using the cards to get me thinking, like any other set of prompts. Which doesn’t explain why the cards work better for me than a random plot or random character generator. I suppose that could just be that I’m more inspired by pretty pictures, or that the symbolism on the cards I use works for me. That theory might explain how I can do accurate (or at least accurate-seeming) readings in person for people I know. My mind can, in theory, create meaning because I know the querant or because I can read their reactions as I talk. It’s not a convincing explanation for how I personally do readings in person for strangers, especially since I’m not particularly good at picking up on body language, and when I started doing readings (and having them pronounced accurate) I was pretty abysmal at it. Not the cards, I was abysmal at reading people. That theory also doesn’t explain how I can do accurate readings for strangers over the internet. Like I said, it’s mysterious. The scientist in me is frustrated by the lack of explanations. The mystic in me, however, finds the lack of explanation, the fundamental mystery of it, quite satisfying. It says to the rest of me that we are finite beings in an infinite world. There should be things we don’t understand. My approach to fantasy is like that too. The scientist in me wants to understand how magic works, and why, and for it to be predictable. But still, when reading or writing, I’m more drawn to the mysterious, the unexplained, sometimes even the unexplainable. Maybe especially the unexplainable. I find magic in stories most satisfying when there’s a lot of wonder, and very little “game mechanics.” Or to put it another way, when it feels magical. And never mind that that other side of me never stops trying to find the explanations. Or maybe that’s a part of the attraction? Here’s a thing I don’t know yet. How can I not want to get to know it better, to find it in the wild (even if just in the wilds of my own imagination) and try to tame it? Is it a kitten or a lion cub or something totally unexpected? With time, persistence, and patience, perhaps I’ll find out. So, life has been busy. I’ll try to post about October later, but for the moment, I thought I’d natter about this week. Or at least one part of this week, that being house stuff. I’ve been waiting for the weather to be dry enough and calm enough (in terms of wind) to get my roof repaired. The first snow of the season made it Very Clear that I needed to get part of the wall repaired too. This is not good for my budget, but the repairs will indeed be good for my house, even if it will have something of a patchwork look—I don’t have enough of the old siding to cover the repairs, so they’re putting new siding on the walls they are repairing. I’m not sure when we can do the rest of the house; I’ll have to consult the budget and it seems likely that the weather wouldn’t cooperate for redoing the whole thing anyway. While I was waiting, and writing at the kitchen table (sometimes a change of scenery is good for the writing), I got tired of looking at a kitchen window where the top has persistently refused to be closeable—you know, the old double-hung windows, designed so you can open the top for air flow in the summer? I’d hoped a little stubborn insistence and careful application of brute force on my part would let me close it up for the winter but no. Someone in this house’s past had painted it in place, down more than an inch on one side and less than an inch on the other. Yes, they painted it not-shut crooked. So I’ve been taking the window apart and repairing plaster and trying to get that corner of the kitchen ready for paint, and also doing stuff like painting bits of wood in my kitchen so repairs outside will have paint that doesn’t slough off because it froze instead of sealing to the wood. And today I have the old mailbox inside, for sanding and painting, so it can be re-hung over the new siding without looking rusty and disgusting. I guess it’s like editing a story—the bones are good, but there are bits that have to go, and bits that just need fixing up. And it always seems to take more time and futzing than you expected. It’s also good to have friends who can help. A friend came by today to show me how to wiggle the wood to get that top window, which I’d finally gotten to move, out of the casing altogether so we can re-do the glazing compound and be assured the glass won’t fall out some cold, windy day. Also, thank goodness for storm windows. I get to do all this and stay warm in the kitchen. So, have you had home-repair, decorating, or organizing challenges lately? Yesterday, we went on a quest. See, Mystique bought me a ring years ago, a goddess/tree of life that, at first glimpse, resembled a stylized owl's head. I lost it a while back when we went to see Tammy Baldwin speak. We got it from the artist at Bastille Days, but the last time we saw the artist there, he told us had decided to only come to Milwaukee for Irish Fest. I really wanted to replace the ring, but was stymied because I couldn't remember his name and didn't have contact information for him. So, yesterday's quest was to see if he was still, after all these years, showing work at Irish Fest, since I had no clue how else to try to find him. We peered at the map near one of the beer stalls, and a gentleman suggested we head to the far north of the fest grounds. We did indeed find some beautiful jewelry there, but not the artist we were looking for. So then we walked all the way to the south end, where we found beautiful music, but not the artist we were looking for. I was disappointed, because we thought we had found all the little clusters of artists. So we headed toward the band some of our friends planned to watch, but on the way we found a building with more people selling stuff. So it was that at the far end of the last group of sellers, we found him--and he remembered us! Of course, he hasn't sold that particular ring for years, so he didn't have one with him. But he remembers it and can have more made. I tried on a ring with a similar shape, for size, and he made a note of it. So, now when he gets home, he is going to send a picture to make sure we're talking about the same ring, and he will have one cast for me. He warned it would take a while, and I should be persistent about checking back with him until I get it. But I will be able to get a replacement! It took a while to find our friends in the crowd. That happened with the help of a lured pokestop. It's amazing how much I've come to appreciate having virtual landmarks in crowded places. I'm also finding a lot more of the art and historical monuments around me because of the silly game. That virtual landmark thing. A little later I went on a separate quest, hoping to find food I could trust not to make me sick, and totally failed. I hadn't thought that would be so hard, but the two places I'd found that could feed me at Summerfest weren't there for Irish Fest. But I knew I had food at home, and the quest I thought was less likely was successful, so overall I'm pleased. It’s been a while, hasn’t it? I’ve been busy gardening (I’ve gotten pictures on my Facebook), working on defeating the GOP (I’ve posted about that on Facebook too), and writing. Time flies when you're busy; I didn't realize it's been so long. I have also been posting to my Patreon. A good number of the posts become public after a while, and I recently put a few things there open to the public as gifts to my friends as a kind of birthday celebration. You do not have to sign up as my patron to read or comment on public posts, though if you can and want to, you would be very welcome. As to the writing, I’m almost 29000 words into my Cozy Mystery With Sea Monsters. (That’s the elevator pitch, at least, and I suppose it’s the working title too. I’ll worry about a real title later.) My amateur sleuth is busy annoying the professional ones, of course. I'm having fun writing it. I also wrote a story to submit to Sword and Sorceress 33—and it sold! The anthology will be out in November. It's called Lin's Hoard. More details when I have them. More recently, I wrote a 6500 word story for an anthology on fighting fascism, which I think is a really good story. At least I hope it is! Longer stories usually have to be excellent to sell. For some reason, I'm having more trouble than usual forgetting this one is out there, in the editors' submission pool. Cleaning house and otherwise getting ready for a phone bank pretty much took up my birthday, so I was delighted to find a surprise package in my mail today. When I opened it, I found two absolutely beautiful Tarot decks! I am totally claiming them as belated birthday gifts. My errands today ran long, so instead of wrangling things to get the pictures to post directly here, I'm sharing my facebook post. The post is public, so you should be able to just go there and see it. In honor of the gift, I’m doing a card reading. As always, New friends and old are very welcome. About the readings, I'm doing something a little different. All free readings will be done with one of the new decks (the 78 Artist Nautical Tarot or The Oracle of the Dragonfae). People who tip and people who are supporting my Patreon will get a three card reading from one of the new decks or can ask for a single card from one of my other decks. Patreon supporters can always ask for a clarifying card. The guitar case below is my personal PayPal link, featuring my own artwork, which does inspire me even though it isn't Tarot-related. If you want a larger reading we can discuss costs. A signal boost for readings or for my Patereon will also allow you to ask for a clarification card on some part of your reading, if you wish. Regardless of the length of the reading, you may ask about real life or a creative project, even for a character you play in a game. I can draw a card for you to meditate on, to represent the Guide you need right now, or to get you unstuck. I can read for your protagonist or villain, can draw a card or cards for you to use as writing or art prompts. Let me know if you have any particular request. The first card is free (though tips are always appreciated). I understand all too well that when people don't have cash or spoons that is generally when they most need inspiration. Don't be afraid to ask for a card if you can't tip. When you tip, it's helpful to me for you to mention it here so I can connect your Paypal information with your request. Tips should be at least $2 (Paypal charges fees). If Paypal doesn't work for you, drop me a message and we'll work something out. It's also helpful to remind me if you're a Patreon supporter, especially a new one! I will reply to all requests. If I start to get overwhelmed, I will close to free readings; in that unlikely event, that will be in nice bold letters. I plan to stay open until late Friday for free readings. After that, you can ask for a paid reading, if you want one. Thank you, Blessed Be, and may your day be full of joy and dreams made happily true! As always, while I work hard to offer insight and inspiration, all I can legally promise is entertainment. See my "Dandelyon's Readings" page for a little more about my readings. This should probably be a Patreon post, and I will likely put some version or follow-up of this there, but you folks asked me about whether I've thought about designing a Tarot or other divination deck, and that led to thinky thoughts about what I would want to do, if I were going to go to the trouble of designing 78 (or so) cards. And I'd like feedback on these thoughts, which is more likely to happen here. So, my first thought is that one of the things a Tarot deck is is a symbolic representation of the world and the people in it. Given that the decks were first designed in the middle ages, it is not really surprising that the worldview pictured in most decks is really pretty true to those origins. We have kings, queens, knights, and pages. Women other than queens are not represented in the court cards, and are generally treated as beings of lesser importance than men. Likewise, children and elders are rarely represented. Intersex, trans, and enby people are not represented at all. And yet, if we move away from the imagery of kings and queens, knights and servants, what would be a better representational model for the world? There are other things to consider as well. Economic and political models have changed a lot since medieval times. Education has changed as well, and radio, television, and the internet have also changed how the world works, and how we see ourselves and each other. I don't see a need in this world for yet another medieval-world-view Tarot deck. I'm not sure there's a need, exactly, for a Tarot that more accurately reflects the world of today and tomorrow, but certainly if I were to spend the time needed to design and properly execute a new deck, that would be far more interesting. It is a constant drain on my energy and focus to know that our government is currently being run by evil men. It is so very hard seeing that there are still Americans who support those men, who don't see that they are doing evil or don't care. It is hard to believe that all of the phone calls and other work I'm doing is making enough of a difference. And the bad men keep ramping up their evil. A friend's husband, who is very sick with multiple conditions, just had a doctor decide to stop prescribing one of his medicines, in between visits and with no explanation. They think it's due to some new policy of our GOP governor. The man who lost the popular vote, but got elected anyway, has ordered our government to take small children away from their parents, with no plan to ever give them back, no way to even track which children belong to which parents. Reportedly, some of the parents have been deported while the children remain here. This horror has been brought to us by "the family values party." Mind you, at least one parent told a reporter, "They can deport me, I'll be killed, but at least my daughter will be safe if she's allowed to stay here." I bet the daughter would not be so happy about that result, if we could find her and ask her. All of this makes it hard to write fiction, hard to do art or music. Heck, it makes it hard to want to open my eyes and get up in the morning. This isn't the reality I want to live in. But I'm not going to stop fighting this madness. And I'm not going to stop writing and arting and making music. The creative stuff will just be slower, I'm afraid. I had some tomato plants that sprouted very late last year. I'm not sure why I was still watering those pots inside, but I was, and once they sprouted, well, they were alive and mine to care for. It was clear they wouldn't grow big enough to give me tomatoes if I put them outside, so I moved them into bigger pots and let them grow inside overwinter. We got the three biggest ones outside yesterday, but unfortunately My Angel shoveled through the seep hose in the process. So we spent hours digging most of a new trench to relay a replacement. At least when they were on sale last year, I bought an extra one, so we were able to get started right away. However, my knees are NOT happy with me. I was so tired, I slept through my alarm, and so my morning's plans were effectively cancelled, but I did get to the pokemon raid gathering, and a few people were very happy to sign petitions to get Tammy Baldwin (our wonderful Democratic U.S. Senator) and another Democrat on the ballot. It was a bit chaotic, getting signatures before and after raids, but it was fun. But I also ended up a bit sunburned from being out so long two bright days in a row, so soon after we had snow. I don't burn the way I used to when I was younger, but that doesn't mean I don't burn. So I got back home tired, aching, and headachy. I guess it's a good thing I chose a t-shirt with sleeves, knowing I planned to be standing outside whether or not it stayed warm. This is bad enough without adding sunburned shoulders. The rest of the seep hose will have to wait a couple of days, I'm afraid, which means watering the newly-planted tomato plants with gallon jugs. But that was the plan anyway, since the line that leads outside leaks badly. That on the list of things to be fixed very soon. So, where was I? Oh, yeah, I was tired, headachy, and not very with it when I got home. I grabbed some chicken, Beanitos and cold water, smeared aloe vera cream on my face (and eventually on my scalp) and stared at some TV we wanted to see before erasing it from the DVR. And I paid some of the month's bills, slowly. And then fell asleep, without posting! Happy Monday, everyone. I guess I should get to work paying the rest of the bills and doing other paperwork, since I shouldn't go out in the sun at least until it's a bit lower in the sky. The more air between me and those rays, right now, the better. Too bad--I've got beans to plant, and doubtless other stuff. But this sudden leap from snow-covered everything to summer weather is hard on a person, and pushing too much today won't be more productive in the long run. But still, it's frustrating that now that the weather isn't keeping me from planting stuff, I need to stay inside. Bills. Right. See you all later. So, one of the reasons that the work to get out the vote was so exhausting in March was that we couldn't find a place to run canvassing out of, and in the end I offered my house. Now, my house has a number of in-progress projects happening, some that we're doing ourselves and some that we have friends working on, when they can. That means that there are some rooms that are, essentially, construction areas and other rooms that are cluttered with the stuff that belongs in those rooms. Also, I'm still in the process of gathering stuff to get rid of. Cleaning up the rooms to be used to host the canvassing and phone banking required a trip to the thrift store to donate items that I'd bagged or boxed (including a bunch of miscellaneous glassware that and dishes that were replaced by better stuff I inherited from my aunt); a trip to the dump to get rid of some old electronics; moving stuff upstairs or downstairs into different temporary storage areas; and a lot of cleaning and organizing. The dragons, which arrived from e-bay as plain black resin, were painted some months ago. It was a real pleasure to finally get them up on the wall! Now, I'm guessing that my wonderful friends' advice will let you see pictures of the bathroom! For a closeup of the dragons, you can check out one of my public Patreon posts: www.patreon.com/posts/my-bathroom-17680012 There's a poem over there too. Hello! It's been a busy year, and the end of winter is always hard on my health. I've been working on getting out the vote for Wisconsin elections, and we got a progressive woman elected to Wiscosin's Supreme Court, a Judge with a lot more experience than either her Democratic challenger in the primary or her Republican challenger. But it was a lot of work, and exhausting in a time of year when my energy is low anyway. To facilitate this, we ended up doing a bunch of work on the house, and I'd share a couple of photos here, but I still haven't figured out how to get DW to actually display my photos, and I want to get this post up. So, I finally got the cool dragon towel holders on the walls in the downstairs bathroom, and they look great. And then there were taxes, which I wrote about in my Patreon, over here: https://www.patreon.com/posts/artist-and-tax-18012188 The piece is called The Artist and the Tax Monster. And then the power thingy in my backup computer broke. The plastic is visibly cracked and I can't get power into the thing, so until that's fixed, that computer is not doing a dang thing. Then my partner accidentally knocked my primary computer to the floor and disconnected the screen from the rest of the computer, so that computer will need to be sent away for weeks to find out if it's even worth fixing. Aaaaaugh. That decidedly less pleasant photo is also on facebook instead of here. So on the new moon this month, I got a new tiny computer that is partially set up now, and to celebrate I'm doing New Moon readings. Doubtless with typos. I apologize ahead of time. You can simply ask for a single card with no obligation to tip (though tips are very much appreciated, and allow you to ask for a clarifying card if the reading is not clear). The guitar case below is my personal PayPal link, featuring my own artwork, which does inspire me even though it isn't Tarot-related. Supporters of my Patreon at the $5 level get a two-card reading instead of one. I am also offering a three-card reading for $20 or a five-card reading for $35, or if you want a larger reading we can discuss costs. A signal boost for readings or for my Patereon will also allow you to ask for a clarification card on some part of this reading, if you wish. Regardless of the length of the reading, you may ask about real life or a creative project, even for a character you play in a game. I can draw a card for you to meditate on, to represent the Guide you need right now, or to get you unstuck. I can draw a card for your protagonist or villain, or can draw a card or cards for you to use as writing or art prompts, and I can modify a more-traditional five-card spread into a prompt for a story focusing on plot or characters or a little of both. Let me know if you have any particular request. For free one card readings, you can pick from my decks, including the Brian Froud's Faeries Oracle, the Daughters of the Moon Tarot (one of the round decks), or the Shapeshifter Tarot. If you want a Guide to companion you in the new year or the holidays, the Susan Seddon Boulet art cards or Fairies Oracle both work well. If you don't pick a deck, I might pick from any of the decks available to me. I will reply to all requests. If I start to get overwhelmed, I will close to free readings; in that unlikely event, that will be in nice bold letters afte word Status below. I plan to stay open until late Friday for free readings. After that, you can ask for a paid reading, if you want one. Thank you, Blessed Be, and may your new year be full of joy and dreams made happily true! Anyone can make nominations, but you cannot nominate yourself. If you want, you can nominate Dandelyon's Readings in the Other category in this post here. You have to make nominations in January. I will be making some nominations in the next two or three days. If you are doing a project that qualifies, please let me know about it and I'll check it out. I do already have some projects in mind, but I'm happy to at least take a look! I've found some cool things in years past, looking at other people's nominations. Edit: I meant to list the categories! They are Art, Fiction, Poetry, Web Comic, Other Project, and Patron. We took Amitiel to the vet again today for a blood pressure recheck. It's still a little high, but no longer dangerously so. He has lost some weight, even though he's still happily eating. It's clear he's getting close to leaving us, but not how soon that will be. He purred and purred again for the vet and his assistant. More details below for people who are interested in the medical stuff. He was having a little trouble breathing, so the vet did an ultrasound. The kidneys are huge and filled with fluid. No kidney stones (which is what the vet expected since there's no evidence of blockage--he's still peeing on the floor). The current kidney diagnosis is either hydronephrosis or perhaps a genetic disease similar to cyctic fibrosis (which the vet says usually kills cats within a year). They can't do anything significant for either disease. Amitiel also had fluid in his chest cavity, which we had the vet drain. There was quite a lot of the pinkish stuff, and the vet said that meant either lymphoma or FIV. We have two other cats, so paid for the FIV test, which came back negative. That's good news for the other cats, at least. But that leaves him with a diagnosis of kidney disease and cancer. I did ask about calcitriol, which the vet said would not do him any good and might stress his poor kidneys even more. That was also the reason given for not prescribing a diuretic to try to slow the recurrence of fluid buildup in the chest cavity. They did give him a shot of steroids to reduce inflammation and hopefully slow the return of the fluid. That should make him more comfortable for a while, at least. So we're back to loving him, feeding him as much as he wants (while trying not to overfeed the two younger cats, who are getting chubby), giving him the blood pressure medicine daily and hydrating him when needed. In other news, I've had a sore throat for two days, and am pretty foggy-brained. I hope this is the worst of it and not the start of one of the horrible flu strains going around. Anyone who poses at least one question/topic about Tarot, writing, music, art, or some other creative thing I do can request a card. If you don't want a card, you can still ask a question or suggest a topic (or more than one), and receive my thanks for your kindness. All of my Patrons over on Patreon can ask for a card, and people who are Patrons specifically for my Tarot work get two. Just remind me. Please feel free to ask a question or suggest a topic if you want, but it's not required of patrons. Anyone who tips can also get a card whether or not they pose a question or topic hook. The guitar case below is my personal PayPal link, featuring my own artwork, which still inspires me even though it isn't Tarot-related. Patrons, people who have tipped, and people who have signal boosted (for this draw or for my Patreon) can ask a clarifying question after I do their reading, and I will draw another card for you. I am continuing to offer a five-card reading for $25, or if you want a larger reading we can discuss costs. You may ask about real life or a creative project, even for a character you play in a game. I can draw a card for you to meditate on, to represent the Guide you need right now, or to get you unstuck. I can draw a card for your protagonist or villain, or can draw a card or cards for you to use as writing or art prompts, and I can modify a more-traditional five-card spread into a prompt for a story focusing on plot or characters or a little of both. Let me know if you have any particular request. You can pick from my decks, including the Brian Froud's Faeries Oracle, the Daughters of the Moon Tarot (one of the round decks), or the Shapeshifter Tarot. If you want a Guide to companion you in the new year or the holidays, the Susan Seddon Boulet or Fairies Oracle both work well. If you don't pick a deck, I might pick from any of the decks available to me (I have a whole shelf of them). I understand all too well that when people don't have cash or spoons that is generally when they most need inspiration. Don't be afraid to ask for a card if you can't tip--just let me know some topic or question you'd like me to post about. If you're not a Patron, and I use your question for a patrons-only post, I will privately share that post with you as a thank-you. If I use it for a public post, I'll reply with the link. When you tip, it's helpful to me for you to mention it here so I can connect your Paypal information with your request. Tips should be at least $2 (Paypal charges fees). If Paypal doesn't work for you, drop me a message and we'll work something out. I will reply to all requests, though with the contest and writers group this weekend, there may be a little delay, depending on when I see your post. Status: Open! I plan to leave this post open through Sunday night. As always, while I work hard to offer insight and inspiration, all I can legally promise is entertainment. See my "Dandelyon's Readings" page if you have questions. The holidays are always busy, and always fraught with food-danger. I lost most of Christmas Day to food allergies, but had a good Christmas anyway, getting to see family and being gifted with way too many Deirdre-safe cookies and even a pie by my daughter. Oh, well, those will keep. So, here we are on New Year's Day, looking at a new year that, I hope, will bring better things to us all than the old one did. Come, visit a while, and I'll do a reading if you want. You can simply ask for a single card (with the usual clarifying card for people who tip). The guitar case below is my personal PayPal link, featuring my own artwork, which still inspires me even though it isn't Tarot-related. I am also offering a five-card reading for $25, or if you want a larger reading we can discuss costs. A signal boost for readings or for my Patereon will allow you to ask for a clarification card on some part of this reading, if you wish. For free one card readings, you can pick from my decks, including the Brian Froud's Faeries Oracle, the Daughters of the Moon Tarot (one of the round decks), or the Shapeshifter Tarot. If you want a Guide to companion you in the new year or the holidays, the Susan Seddon Boulet or Fairies Oracle both work well. If you don't pick a deck, I might pick from any of the decks available to me. I will reply to all requests, though with the holidays, there may be a delay in getting to you. We got out to a proper Solstice party today, and a ritual. As part of the ritual, we were invited to talk about our intentions for the new year. Now, I've never been much for New Year's Resolutions. They're usually rash promises for radical change, things we think we ought to do, and hope that a public declaration will give us some magical resolve or insight that makes us different people. I want to make good art. And good music and good stories. None of those things are new. All of those things are things I'm doing already, at least a little. But in this coming year, I want to do them more and better. No radical changes, just more and better. That's a new year's intention I think I can keep. 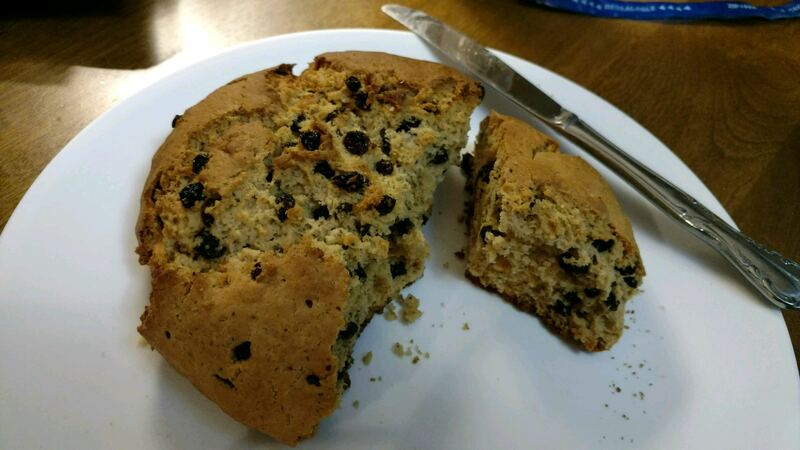 Over the weekend, I visited my sister, and we made Irish Soda Bread with Deirdre-safe ingredients. Yum! Reminder: I'm still open for card readings, if you want one. The interwebs tell me that this is the "Micro Moon." I'm not quite sure what to make of that, except of course that it's time to read cards for people. The Winter Solstice is coming up too. Given how busy things are for everyone (including me), I'm leaving this open until December 23. Feel free to ask about the new year if you want, since magically the new moon and new year are the same kind of energy, but I do plan to do a Full Moon reading on January 1, so you can, instead, ask for advice on handling the holidays or on new projects or, really, anything you want. If you want to give me a present this Yule, please go look at my Patreon, I'd love to hear what you think. I'll be posting a 1st draft chapter of my Quirky Writer's Guide to Foiling Writer's Block in the next day or two, and then will start work on a post for my very first (and treasured) patron. Would people be interested in a more expensive reading for the new year? If so, a month-by month reading or something else? If there's interest, I can arrange to do that on the Solstice or as part of the January 1 readings. I am also offering a five-card reading for $25, or if you want a larger reading we can discuss costs. A signal boost for readings or for the Patereon will allow you to ask for a clarification card on some part of this reading, if you wish. Thank you, Blessed Be, and may whatever holidays you celebrate be low-stress and joyful! Moving forward, one bit at a time: I have a Patreon now! So, I now have a paid DreamWidth account and have set up one final import. There's not a lot that I expect to change here except that I'll get all my icons imported. Sadly, DW isn't set up to import photos hosted on LJ, so the old posts will lose their photos. It's imperfect, but it's the best I can do. I will not give money to people who not only imposed objectionable TOS on people, but did it without warning and made it impossible to even back up your blog to another site without pressing that "agree" button. Next, I will see about crossposting without using LJ as an intermediary. Also, as I noted during the last readings, I've set up a Patreon. Naturally, shortly after I did that, Patreon decided to change how they charge people, which caused a lot of uproar. Unlike the GOP, the people running Patreon listened to their Creators and Patrons and changed their minds, sending out an e-mail this morning. But until that happened, I felt weird about asking my old and new friends to send me one or more dollars, knowing that Patreon had said they would be charging patrons more than the pledged amount. But now, that is no longer the case, so instead of saying, "I'm aware of this and will be investigating other options", I can simply invite you along for the adventure. So, with butterflies in my stomach, here it is: Deirdre's Patreon. I just put up a second free post, and will add some more Patrons Only posts soon. I've been busy. I made a Patreon Page, but what with conventions and Thanksgiving and so much else, I've had the start of a post telling people about it hanging out on my computer for days. So there's a couple of posts (one free and one for supporters) there that no one has seen or commented on, and I have no patrons at all yet. I also have started to figure out all the things I should do before I close my LJ account. And I won NaNoWriMo, finishing a young adult novel and starting the sequel. I also rewrote the prequel, though I didn't count that toward my word count. And I called my congress critters. (Shame on my Republican Senator for allowing a vote on an unfinished and unread bill!). I even managed to catch Ho-Oh. And now I'd better pay bills and sign up for healthcare and make my lists (and check them twice) and...lots of stuff! So I feel reasonably accomplished, and yet totally behind too! Oh, well, such is life. And here it is, the full moon again. It's allegedly the "Cold Moon", though it's been in the 50s out during the day. Climate change is no joke, folks. But still, it's the full moon, and so it is time for readings. New friends and old are very welcome. I am also offering a five-card reading for $25, or if you want a larger reading we can discuss costs. As always, a signal boost will allow you to ask for a clarification card on some part of this reading, if you wish. Alternatively, for at least $10 you can ask for a Torn World reading and get an in-character reading set in Affamarg or the Breidalam Mountains using that world's standard layout for the divination disks. Regardless of the length of the reading, you may ask about real life or a creative project, even for a character you play in a game. I can draw a card for you to meditate on, to represent the Guide you need right now, or to get you unstuck. I can draw a card for your protagonist or villain, or can draw a card or cards for you to use as writing or art prompts, and I can modify a more-traditional five-card spread into a prompt for a story focusing on plot or characters or a little of both. Or I could do something completely different. Let me know if you have any particular request. For free one card readings, you can pick from the Brian Froud's Faeries Oracle, the Daughters of the Moon Tarot (one of the round decks), or the Shapeshifter Tarot. If you don't pick a deck, I might pick from any of the decks available to me. The first card is free (though tips are always appreciated). Paid readings, short or long, also let you ask me to use any of my other decks, including but not limited to my combined Susan Seddon Boulet Animal Spirits and Goddesses cards and my Fantasy Showcase Tarot deck where each card was done by a different science fiction/fantasy artist. Tipping can also be used to request a private reading. I understand all too well that when people don't have cash or spoons that is generally when they most need inspiration. Don't be afraid to ask for a card if you can't tip. I've written before about why I do readings and about some of the decks I use here, feel free to hop over and check me out. I'll wait. I will reply to all requests. In the highly unlikely event that the number of requests nears my limits, I'll close this card draw by changing the status line below rather than risk leaving anyone without a response. Thank you, and Blessed Be! Status: Open to free one-card readings until I go to sleep Monday night (which will doubtless be well after midnight) and open to tipped readings until this status message is changed. As always, these readings are for entertainment and inspiration only. See my "Dandelyon's Readings" page if you have questions. Current Music: Seanan and Amy and Judi and more!